Take Gelone multipurpose solution with you wherever you go with this small and practical package. Supplied in an airline-approved 50 ml bottle, this handy solution is perfect for your travels, and is also ideal to keep in your handbag, gym bag, or desk drawer for whenever your lenses need care. This small-sized bottle goes wherever you go (and wherever 100 ml-or-less containers are allowed), making it perfect for summer excursions and getaways. 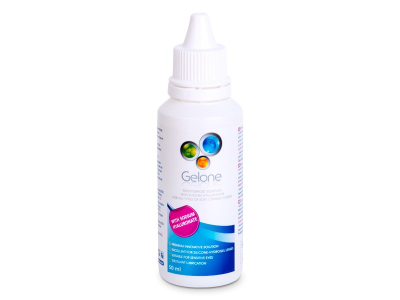 Gelone is a multipurpose solution that is suitable for use with all types of soft contact lenses. It cleans effectively whenever lenses are not in use, and its unique formula contains a combination of disinfectants and hyaluronic acid, which provides gentle hydration for even the most sensitive eyes. Hyaluronic acid is a naturally occuring substance that provides moisture for all-day comfort of wear. Sodium hyaluronate (or hyaluronic acid) is one of the main ingredients in Gelone solution. This substance is completely natural to the human body and is fully compatible with the inner environment of the eye. It is found, for example, in the vitreous humour, or the gel-like fluid that makes up the eyeball. Hyaluronic acid has the unique ability to bind and retain large amounts of water, therefore Gelone solution noticeably increases the comfort and hydration of wearing lenses. This remarkable substance also helps to promote cell regeneration and tissue healing, and can thus help repair minor damage due to eye irritation from environmental factors like dust, dirt, or smog. Gelone solution is also available in a larger 100 ml bottle, 360 ml bottle, or our double pack, triple pack, and family-sized four pack of 360 ml bottles. Hi. Can I use this as a lens lubricator? Hi, Yes, this solution is designed to keep your soft contact lenses moist and clean.